5 different colours to suit your mood! 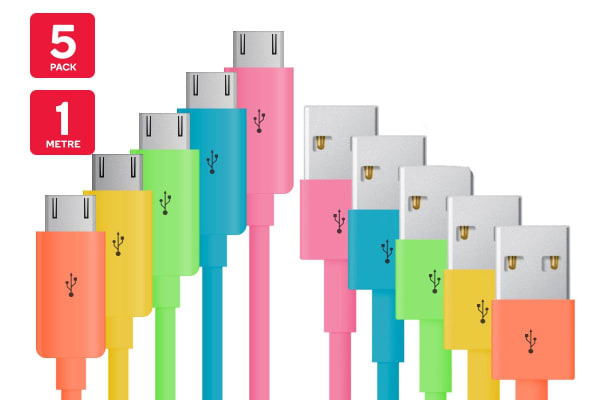 This set of 5 colourful Micro USB to USB cables let you keep track of spare cables in your home and have your devices charged in no time at all! 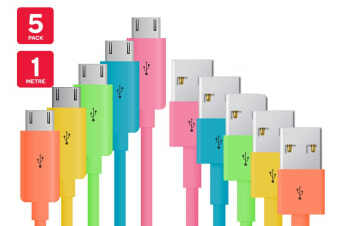 This multicoloured 5 Pack Micro USB to USB Cables have your media devices ready and running in no time at all thanks to their rapid charging capabilities. With a length of 1m, these cables gives you the freedom to charge your phone even when you’re lounging on your chair or stretching out on your bed. With reliable and sturdy adapters, they won’t ever let you down by falling or slipping off at the most inconvenient times! Keep within easy reach as spares around your home to have your devices charged and ready to go anytime!